Lead Sheet Triads - The New Musical Shorthand! Lead Sheet Triads are the "new" musical shorthand! Many years ago, the musical shorthand was the use of Roman Numerals in what was called "Figured Bass". Now, in contemporary or modern music, we do not find that Roman Numerals are used very often! Letters are used to indicate the root of each chord, and are used to name the chord. These letters are called the Lead Sheet Triads. Lead Sheet Triads and Figured Bass - What's The Difference? Lead Sheet Triads use letter names to show the tonality of the triad, and a letter name to show the bass note (or the lowest note if using one staff) to indicate the position/inversion. Figured Bass uses Roman Numerals to show the tonality of the triad, and small numbers (written like a fraction) to indicate the position/inversion. When analyzing music, we usually notate the Lead Sheet Triads above the staff. Figured Bass notations are written below the staff. Did you notice that the Lead Sheet Triads look a lot like those letters written above modern music that are usually played by Guitar players? That's right! And guess what - the "Lead Sheet Triads" are simply the "Root/Quality Chord Symbols" that we have learned for years and years in Harmony - and they are not all that new! Lead Sheet Triads - What Do They Tell Us? Triads are introduced in the Ultimate Music Theory Workbooks on Page 86 of the Basic Rudiments Workbook (and on Page 80 of the Prep 1 Rudiments Workbook). A Triad is 3 notes that contains of a Root, Third and Fifth. A Triad has a position. Root Position: the Root is the lowest (bottom) note. First Inversion: the Third is the lowest (bottom) note. Second Inversion: the Fifth is the lowest (bottom) note. And, it is SO EASY to teach (and then use in your student's theory and practical work!). 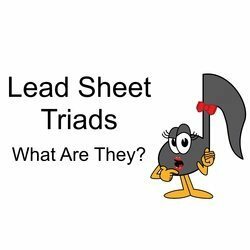 Lead Sheet Triads - How Do We Write Them? A Lead Sheet Triad will consist of either one or two letters. If there is one letter (from the musical alphabet), then the Triad will be in Root Position. For example: "G" indicates the Major Root Position Triad of G - B - D.
If there is a slash ("/") and a second letter, then that letter will indicate the Bass Note (if the music is on a Grand Staff) or will indicate the lowest note of the Triad (the position of the triad if the music is on a Single Staff). For example: "G/D" indicates the Major Triad of G - B - D in Second Inversion (with the D as the lowest note or with the D in the Bass Staff). The tonality of a triad can be either Major, minor, Augmented or diminished. So let's have some fun! Can you write the following triads based upon these Lead Sheet Triad Letters? Did you remember the tonality for each triad is based first upon the Major Scale? Then each triad is adjusted from the Major. Did you notice that all the triads are in Root Position? That's right - there is no slash, no second letter. Therefore they are all in root position. If writing them on a Grand Staff, the root note would be written in the Bass Staff and the Triad would be written (in any order) in the Treble Staff. The position of a triad can be either Root Position, First Inversion or Second Inversion. When there is a "slash" and then a letter, that second letter indicates the note that will be either the lowest note (in the Bass if the triad is written on the Grand Staff) or the bottom note of the inversion (if the triad is on a single staff). Let's write the following triads based upon these Lead Sheet Triad Letters. For this example, we will simply use a single Treble Staff. Did you write your triads using the correct tonality? Did you write them in the correct positions? Wasn't that fun! I love exploring new ways to make music exciting for my students. Lead Sheet Triads - How to Use Them? Have you ever had a student ask you to teach them a piece of music that is much harder than they are able to handle? Or have they ever shown up with a piece of music that they have downloaded off the net with the Lead Sheet Triads written above the staff? For my students, I teach them how to "realize" (play or perform) the Lead Sheet Triads in their left hand while they play the melody of the music in their right hand. The Lead Sheet Triads provide the foundation for the left hand. The triads can be played first in solid or blocked position in the left hand while the student learns the melody in the right hand. Then you can start to explore playing the triads in broken positions. Eventually you can incorporate different rhythms to match the melody line. All of a sudden, you are teaching your student how to improvise! See - you CAN teach improvisation! And all thanks to Triads. 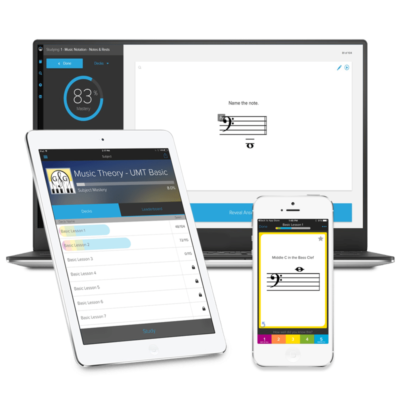 Theory truly is the foundation for learning music! The Treble Staff Worksheets are available in small or large staff sizes. Use these to have your student create a simple melody . Decide on a Key Signature and Time Signature. Working with the triads in that key, add Lead Sheet Triad Letters above the first note of each measure. Students can then "realize" (the "theory" word for play, create or perform) the triads in their left hand while playing the melody line in their right hand. Use the Grand Staff Worksheets to write out your melody and Lead Sheet Triad realization. If the melody is one that your student has created, remind them to print their name as the Composer (on the top right hand side of the first staff) and to create a Title (and write it at the top of the music)! And guess what you have just done? That's right - you will have taught Composition! Wow! You sure are an amazing teacher! I’m wondering if there’s any way to learn to play music using figured bass. That would be easier in the long run, because it would make it SO much easier to transpose. I’m interested in doing some Musicianship Exams and I think reading from figured bass is one of the required elements.